In early 2010, I had my first dose of Glutathione. Within 20-30 minutes I was able to get up out of my wheelchair and walk with ease (comparatively), a large portion of my pain had gone down several orders of magnitude. I was able to think more clearly, communicate more clearly. Compared to how I was before my first dose, I was stronger with more stamina and available energy before I “hit the wall“. It seemed to make most of my more obvious and larger symptoms better. At the time, it was unquestionably a miraculous difference. The effects of Glutathione would last until the next day or, if I spent too much energy, it would wear off quickly. With Glutathione I still “hit the wall“, but I’m able to do more before that happens. Glutathione was/is like a currency to me. It meant could spend it on a few more minutes with my son, pick him up and hold him. Be at least somewhat interactive with him. Or perhaps it might mean that I could leave the house and make it through a short outing. I still pay heavily for anything I try to do, but at least I can get a few more moments of life. The Dr that gave me the first dose was hardly knowledgeable and I had no trust in him, but not many Dr’s perform Glutathione IV’s so there weren’t many options. While the Glutathione was amazing, almost miraculous at first, I soon started to urinate a lot of blood immediately after his treatments. Between the unpredictable amounts of energy I’d have making it hard to make/keep appointments, the cost of the IV’s ($150-$175 each) and the complete lack of trust in the medical system I’ve since developed – if I wanted to have any chance at all of beating this monster the only way was to teach myself to perform my own IV’s. The cost is about 1/3 and I can have it whenever I need it. The problem was that I was terrified of needles and my vision was/is doubled and blurry – although Glutathione helped with that too. If properly motivated, you’ll be amazed at what you can accomplish. I was a new father when this happened, and I was missing my sons life. I made the only choice available. I’m sure many of you will understand this part too; I had too much shame about being sick that I couldn’t bring myself to ask for help. I also refused to let Big Pharma’s killing machine to take away from her or my son anymore than they already had. I didn’t want Nikki to have to see this, she deserved better I thought. She did help those first few times. But I really needed it everyday, and I was so ashamed of what had become of me that on most days I wouldn’t ask. And I’d go without, even though it made me so much worse without. I knew that had to change. My family needs me to get better. So I found this Dremel Desktop Vice on amazon which I thought just *might* work as an extra hand. It worked! This allows me to do my IV’s on my own and not be a burden. (See Glutathione IV – by yourself) Over the last 4.5 years I’ve self-administered approximately 350-400 Glutathione IV’s. Glutathione helps to raise my baseline and lowers the intensity of the associated symptoms. So if I can get through a few doses, soon my eyesight will also improve and the process becomes easier. Once we moved to Boulder in the fall of 2010, my baseline was much lower than it was over that summer (I’m always better in warm weather). This meant that I was too shaky, weak and my vision was too bad to continue attempting my own IV’s. I kept failing. So by early 2011 I got the first of 4 PICC lines installed. Each PICC line would last approx 2 weeks. My skin had a terrible reaction and when my Nurse would pull of the first dressing, it took off a lot of my skin with it. My nurses tried special Tegaderm dressings and other things to try to help. But soon puss develops under the dressing making it and the Stat-Lock fall off. It was awesomely convenient having a PICC, I could easily get my Glutathione and Saline on short notice no matter how bad my eyes were. But I had to take them out. Each PICC lasted a shorter time than the first. I had no choice but to return to site-injected IV’s. When I’d go for longer than a few days without Glutathione, my baseline would lower considerably. That also meant that the double-vision was more pronounced, which obviously makes doing my own IV’s much more difficult. I’ve learned to compensate somewhat by relying mostly on my left eye. Much like looking through a rifle scope, both eyes are open but you’re only trying to use one of them. For me, it’s the left one. I also do this early in the day when I’m at my best, which helps. That said, I still miss the veins at times. But I need my “spinach” as I call it. So what do I do when I miss? I don’t have the luxury of giving up – neither do you. Grab another infusion set, find another spot on my other hand and do it again and again until I succeed. The lower my baseline is, the harder this process becomes. Point is if I can do it, with all my roadblocks/issues, so can you. If you’re reading this, it’s likely that you’ve already faced things far scarier than a simple IV. A low baseline day in 2012. I don’t miss as often as I used to, but it happens. Get up, dust myself off and give it another go. 3 years ago our Disability Insurance stopped payments which we are suing to get back. This left me unable to afford care of any type, including my Glutathione. I had gone a long time without. My parents began buying small amounts of it for me, thank God for them. But they’re not wealthy and it’s quite a strain. Instead of getting it every day as I had been, I’ve stretched it to once every 10-14 days to make my supply last and to try and lessen the burden on my parents. As a direct result, over the last 3 years my “high” baseline has continually deteriorated as the Mitochondrial disorder progressed. To me that means that every time I push myself too hard and “hit the wall”, it takes me longer and longer to recover to my previous baseline. Which means that unlike the first year or so on Glutathione, now it might take a month or more of every day IV’s to help me recover to my previous baseline. If I drain my batteries far enough or am without Glutathione, it seems I never fully recover and my new baseline is (so far) permanently lowered. During the lowest of baseline days – when the heaviness of my body, slowness of mind, pain and other symptoms are at their worst – I notice an almost immediate night and day difference. On my better, higher baseline days/times, the impact is not nearly as noticeable. Instead, while I still notice positive effects within 30-40 mins, the improvements are more gradual and more noticeable after several days of treatment. Glutathione helped me begin to fight back and slow the progression of this horrific disorder. For me, there was also an added benefit. 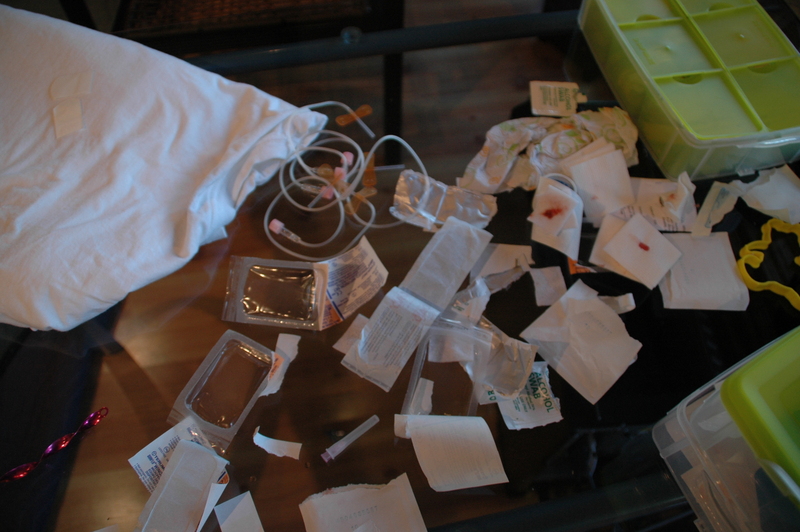 Each time I’d successfully do my own IV, I felt like I was no longer a victim. I felt ten feet tall and bulletproof. Which in and of itself is an important effect that has significant impact on my spirits. Thank you Neil, I hope you can find something of value here. I have more to put up once I can get my baseline high enough to make more sense.